McKenna Ryan quilt patterns delight and inspire quilters the world over. 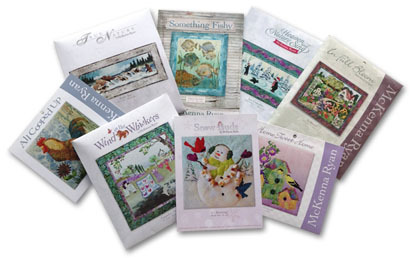 With a wide range of designs from all genres, McKenna’s unique signature style has captured the hearts of quilters for over two decades! Wanting to express the beauty of the natural world, McKenna set out to create a method of appliqué that enables her quilting friends to accomplish intricate designs easily. Not only is the end result gorgeous, but each quilter becomes an artist through the process, finding joy in recreating their very own McKenna masterpiece! Simple Demo of McKenna's fusible applique method.